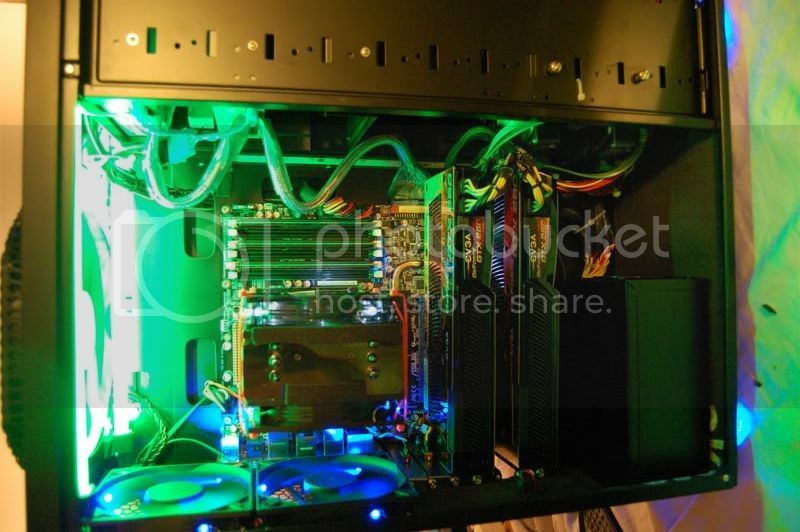 I just built this, installed Vista Ultimate... its running like a dream! I installed CoreTemp and when its idle, none of the cores ever get above 34c (always between 31-34c). When I play COD4 max settings the highest I've seen it hit is 50c (these are good temps right?). VID in CoreTemp reports 1.1625v, but this jumps up sometimes when I open an app or start a game. Frequency is 1600.06MHz (266.68 x 6.0) according to CoreTemp. All settings are factory, I hooked everything up and installed vista, no changes in the bios. So where do I go from here? I'm not much into overclocking and don't really want to oc the chip, but can't it be optimized? I'm kind of new when it comes to these quad cores and voltages and such. Again, cod4 and left 4 dead with max settings is the biggest ride its been on yet. Looking forward to all your suggestions!! you may have to google how to set the memory latencys since they hid it in the p35 version of that mobo - i went to asus after that idiot move and did not use the p45 version. you base is 1.8-1.9v so +.2 = 2.0-2.1v .3 might burn up the memory then again it has lifetime warranty so hold on too the old stuff! Ok wow Lots to take in. I'll order the new Xigma and new ram today, I kind of knew i skimped on the ram, but I can sell it easily. Quick question, what will be the easiest way to get the old arctic silver off the chip? I know I can use some alcohol (right?) on the old cooler and get it off, but what about the actual chip? You said in the original post that you dont want to overclock the chip. You wanted it to optimized, whatever that meant. Optimizing we be undervolting I suppose. Getting the system stable with as little volts power as possbile. You do not need a new cooler or paste. For somebody that doesnt want to overclock why would you adjust system hardware for a rather large overclock. It sounds like your definition of optimizing the cpu falls more into the area of optimizing the OS or something. Since you already ordered the ram. When its installed a simple overclock to 3ghz would be cake. Should hit it on stock volts. But you said the machine flys so i asumme you're happy with how it performs. So why overclock period? Since you don't want to overclock much or at all. I think you need to look at a vista optimization guide. Toms did one a while ago. Turn off a bunch of services to increase performance. A lot of people buy the Arctic Cooler 7 Pro because its very good at cooling and quiet. Not because it is the absolute best at cooling without noise being a consideration. I think a 266 FSB is correct for a q6600. The multiplier should be 8X not 6X. This is supposed to be a bug in CPUz that displays it wrong. Go to My Computer general properties and look at what it says. Being that the multiplier is locked I don't know how you could have accidently set it to 6X. even if the cpu dies in 3 years a q6600 will be $20 in 3 years and the system will be much much faster! i think change my name to "my pushy overlocking"
Sorry to confuse everyone Not my intentions. I did say I wasn't interested in overclocking in the beginning, but that didn't mean I wouldn't be open to the option, especially after getting everythign put together. Thanks dragonsprayer for the comments. If overclocking will give me a considerable performance boost (safely), I'm all for it. I may order the new RAM anyway because I regretted it after putting in the 533mhz. Will replacing the cooler give me a considerable temperature drop? I think I'll start by replacing the RAM, I've already promised I'd sell the 4 gig 533mhz to a buddy and I want to get the 1000mhz anyway, gotta be a good investment at only 40 bucks. I'm still on the fence about the cooler because I'd hate to think that it is not good for a quad core. I got the idea to buy that arctic cooler 7 from a Newegg review who said it worked great with the q6600. Is that what info you mean? thank you! from: mr pushy overcocking! since i make living selling only overclocked systems and come here and tell people how to do it for no charge. years ago, it was top seceret then when i figured we got no credit for others borrowed from us i thought what the heck mights well just peeps hot to do it! the messy instructions above will make you very happy when your gaming! biggest thing is intel overclocks its own cpu's why should you not do it? your basically trading 20% of the life of a cpu u never use for up to double the perforamce - you see 20% boost in some things sometimes much more - the computer is far more reponsive. raid0? single raptor? sorry I dont' know what you mean as far as cpu overclocking..
too big is better - the less drive you use the better. i stick dual 500's in every system. Don't I need a bolt kit for the Xigmateck? I'm not sure which one I need. Thanks! Ok I've got everything. I even put the gskill ram in already, runs great. Now for the cooler, isn't there a special installation method? Like put it on, run it for 10 hours (mb horizontal), remove and reapply? i want to make sure you get it right, some coolers work better with very little thermal compound - but some of the best coolers only work with lots of thermal compound. the thermalright, zigmatek and zero therm all need heavy amounts of compound due to dish shape or heat pipe gaps. you should completely cover the cpu with thermal compound (TC) evenly by troweling it back and forth from center to edge. then add a second amount of TC and spread it in a dime shape circle -this is not important the shaped. what you doing is mounding it up in the middle and making sure it is spread every where so it wets and penetrates or fills (in the case of a dished hs like thermalright). too much is way better then too little! with the ZIG COOLER yes run it flat 24 hours and then install the mobo and run it in bios - this method has worked well for us. heat and flat surface allows it to even out then when you turn it up the hs seems to "draw in" and get closer and temps drop. you should see high temps that drop slightly over the 24 hour period and then drop significantly when installed and burned in at full out put. i am really tired - email me agian and add more! remember to add 2 fans by zip tying! RULE #1: TOO MUCH IS MUCH BETTER THEN TOO LITTLE! Ok I'm about to get started adding the compound. Ok xig is installed, its now in the bios, case sitting horizontal. Right now the CPU Temp is 27c (been on less than 5 minutes). What should I expect? Thanks!! !